Assembled - I'll Be There to Help You | Search Commander, Inc. 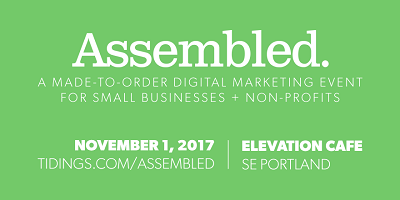 If you are in charge of your companies marketing, there is going to be an event next week in SE Portland, that you can’t afford to miss. All you have to do is show up at any time throughout the day, and help will be available for whatever you need. A round-robin workshop, giving you one on one consultations in private, with experts in every major discipline of digital marketing. Do you have questions? Are you confused by ANY of these things? Besides you, there will be lots of Portland business owners and marketing employees there, with questions to ask in one on one meetings. I’ll be there myself with my own laptop, offering you help with WordPress, Facebook Ads, Google AdWords, SEO, or whatever anyone needs. There will also be at least 17 other expert digital marketers and their laptops too! With over 150+ years of combined experience, there’s probably nothing that you can’t get help with. on the spot. The low $59 cost of attending is less than what any of those people would charge for an hour of their time, but the coupon code ‘searchcommander’ will be automatically applied to save you another $20.